And, in fact, at about the same time as the Bitcoin whitepaper was published (October 31, 2008), the failure of Lehman Brothers as an issuer and underwriter of mortgage-backed securities initiated the largest insolvency proceedings in U.S. history and, subsequently, led to a major economic and political crisis of global dimensions. Bitcoin’s inventor Satoshi Nakamoto is said to have picked that newspaper headline not only to create an immutable time reference for the genesis of the network but also to make a political statement (his own writings support the claim). As announced a few months prior to this event in the whitepaper, Bitcoin was intended to become a peer-to-peer electronic cash system, thereby eliminating the intermediating middleman – probably the prime source of fragility in today’s financial industry. It is perhaps unsurprisingly, then, that people have begun to look into building stable coins based on blockchain technology. While there are already various – technically and legally – different types of stable coins, they often make a reference to a fiat currency, such as the US dollar or Swiss franc. In other words, they replicate their strengths and weaknesses: While most fiat currencies are exceptionally well-suited as transaction media, many of them are highly ineffective when it comes to storing value over time. This is a real issue for poor people with very few or no options to diversify their savings. The control over money is a powerful tool. That is why money and politics tend to go hand in hand. For slightly more than one hundred years, money has come into existence as fiat, i.e., unbacked currency created by an authority – typically the central bank of a country. Fiat currency might be managed diligently in the interest of the “greater good” (whatever that is supposed to mean). However, the past has been anything but a good track record of sound monetary policy. Therefore, it must have been inevitable for F.A. Hayek to refer to the history of money as an “all too monotonous and depressing […] story [of inflation]” (1976, p. 33-34). Tokenization may be the answer! Were it not for the efficiency of money as a medium of exchange, our economic system would revert to a simple barter and gift economy. However, modern monetary systems have become purely instrumental, entirely reduced to a means of creating money out of thin air. We can then ask ourselves: Why not rather link money to economic output than political influence, to real wealth instead of decreed purchasing power? Bitcoin and Ethereum involve native tokens. Such tokens are digital assets without any connection to real-world assets. Now, by means of tokenization, you can basically link tokens tradeable on the blockchain to any asset, in particular shares and bonds; such tokens that leverage the Bitcoin or Ethereum network as underlying platform are called asset-backed tokens. Tradeability, however, is only the first step. The true nature of a good being money, as the economist Fritz Machlup put it, lies in its moneyness. “Moneyness” can best be defined as something, inter alia, durable, portable, fungible, and scarce. Furthermore, where a market exists, liquid trading of such good becomes viable. Also, moneyness is a spectrum – some goods are better suited than others to be widely used as a medium of exchange. In other words, while some goods exhibit high degrees of moneyness – historically, this has been the case for precious metals such as gold and silver –, others only have modest levels of moneyness – services and bicycles are in a rather difficult position to gain widespread acceptance as a means of payment. In his book “The End of Alchemy”, published in 2016, Mervyn King describes the transformation of the world of finance, the banking system, and money. The former Governor of the Bank of England, including during the period of the financial crisis, seems to envisage wealth being used as some sort of transaction medium. What did he possibly mean by that? As Swiss companies have recently begun to tokenize their stocks and bonds using blockchain technology, we will likely see in the future the emergence of freely tradeable and thus highly liquid stocks and bonds outside of traditional organized markets, such as a regulated stock exchange. To be fair: in most instances, such private offerings will unlikely succeed as a new means of payment, and, in many cases, this is not their intention anyway. However, tokenization as a means to facilitate trade of shares and bonds on the blockchain, allows for a very simple solution that may eventually lead to a private means of payment. A company – let us call it “Private Money Ltd.” – that seeks to reflect the value creation in a given economy (e.g., the Swiss Gross Domestic Product, GDP) can purchase assets of the said economy, such as stocks, commodities, real estate, and company loans. By selecting good “proxy assets” for the underlying economy, Private Money Ltd. may effectively emulate the total economic output produced within a given country’s borders on its balance sheet. Now, holding shares of Private Money Ltd. would allow people to participate in the total wealth creation of a country as if they were purchasing each asset of the company’s balance sheet directly. The company’s value would ideally grow or contract at the same speed as the economy’s GDP, thereby more or less keeping share price and production growth (or contraction) in balance. Keeping money stock and production growth (or slow-down) in balance is essentially the policy objective of central banks. However, a private company tokenizing its shares would be less prone to special public and private interests, yet still be accountable to their shareholders. As mentioned above, since such shares would be tokenized, they would become easily accessible to everyone interested. The use of blockchain technology would allow for peer-to-peer exchange (P2P) as if the shares were regular banknotes and coins issued by a nation state. Given sufficient demand for the shares of Private Money Ltd., people could eventually start using them as a private means of exchange. Such a development may seem contrary to Bitcoin’s claim to be a P2P electronic cash system. Indeed, tokenization necessitates a certain degree of centralization. However, cryptocurrencies have, compared to a tokenized balance sheet, one great disadvantage, as they are not backed by anything other than computing power and people’s confidence in its hard coded safeguards. In other words, people typically have only poor expectations as regards Bitcoin’s “fair value”, resulting in a highly volatile price and purchasing power, respectively. A well-diversified asset portfolio is likely superior in terms of stabilizing market expectations in the long run. Having said that, Bitcoin eventually evolving into money and asset-backed tokens being used as such need not be mutually exclusive. In any case, there would be no tokenization without Bitcoin and Ethereum, no asset-backed tokens without their native predecessors. It is only thanks to Bitcoin’s ingenious monetary network design and Ethereum’s progress in developing sophisticated smart contract-systems that we are now able to talk about the likely emergence of new forms of money. This is not the only reason (see, e.g., social scalability; censorship resistance and free speech; access to finance for the unbanked), but it is an important one for us to celebrate Bitcoin’s “genesis block” today. the «monetary guardians» at the central banks (who does watch them btw?!) are the only people that have enough leverage to «inflate» away the ubiquitous problems! The rationale behind such a monetary policy goes as follows: Negative interest rates pressure people to spend money, aiming at cranking up the economy. Doing so, central banks discourage savings and thus long-term investments. However, as long as there is cash money, people have means for avoiding the consequences of such a policy by withdrawing all funds deposited at the bank (the «zero lower bound» problem). Low and negative interest rates disproportionately affect poor people because they are not able to diversify in assets that are less prone to inflation; in other words, poor people are more subject to the effects of financial repression than the rich. The «Cantillon Effect» implies that people «closer to the money» disproportionately benefit from cheap money. By being able to buy assets (estate, stocks etc.) earlier than others, they can buy in at low prices. Employees in banks and corporations as well as politicians are favored by the Cantillon Effect. Governments can refinance their debts at artificially low prices. Many investors, such as pension funds, are legally obliged to hold government bonds; their legitimate earnings are de facto confiscated. Big corporations disproportionately benefit from lower refinancing costs on financial markets (instead of bank borrowing); also, they are economically incentivized to engage in «empire-building», mainly through mergers and acquisitions. As a consequence of the redistributive effects mentioned above, younger people earn less (in real terms) and can save less than previous generations (assets are more expensive in both relative and absolute figures). Since banks, big corporations, and politics are usually located in specific urban areas, people move there, which eventually causes wages and rents to increase even more. In sum, even if the redistributive effects are smaller than expected, monetary policies of such kinds are highly antisocial. The worst part is, however, that the negative consequences do not materialize immediately but only after some time. Tragically, they often go unnoticed by the people most concerned. While one Bitcoin token is currently approaching 5’000 US$, many people wonder why Bitcoin has «value» in the first place. The first question that arises: Might those people actually mean «price» instead of «value»? Well, the concepts of price and value are entirely different. They cannot be the same logically. A person only sells, or buys, a good if the price that she can realize is higher, or lower, than her personal valuation of that specific good. Therefore, any identity of price and value would bring the economy to a halt. Think of bananas: They are beyond doubt highly nutritious. Most people enjoy eating them. However, imagine that humans couldn’t digest bananas. While bananas would still be the same physically, we wouldn’t crave them at all though. There is nothing intrinsic about the value of bananas. Yes, they make sense in our case but they may as well not! Since value is not an «ontological» property of an object, value must be subjective (look up Austrian Economics). Value thus lies in the eye of the beholder. This has major implications: When I value an object dearly, this doesn’t mean that others do as well (or to the same extent). They may even assign a negative value to that object; hence they hate it. Therefore, interpersonal utility comparisons, widely spread in politics and academia nowadays, are literally of no value. This, in turn, means that the positive effects of policies must be limited. Politics, however, is a different topic I don’t want to delve into here. Libertarians probably use the network because they prefer «stateless» cryptocurrencies to legal tender and bank-issued money. They don’t like money that can be created at will and out of thin air. Techies and academics may engage in it because the underlying distributed ledger technology has become a new interesting research area. It allows for «trustless systems», be it payment systems or «decentralized autonomous organizations» (DAOs). Criminals may value the Bitcoin network’s capabilities to disguise their transactions. They presumably like that they are not forced to go through the banking system anymore. Most people (e.g., venture capitalists) probably hold Bitcoins because they can either take part in «initial coin offerings» (ICOs) or they speculate for a rise in prices. This can also be described as Bitcoin’s «bubble economy». Importantly, at the end of the day, the different categories of stakeholders in the Bitcoin network get something in return for their money and time invested in the venture. Obviously, the whole thing is not risk-free. In their eyes and minds, however, Bitcoins are sufficiently valuable to go with the risks associated with the cryptocurrency. To them, there exists a myriad of different reasons as laid out above though. Some people argue that Bitcoin derives its «value» from the electricity put to work within the mining procedure. This, however, sounds like a slightly adapted version of the mistaken «labor theory of value» in classical and Marxist economics. Certainly, electricity is a prerequisite for the decentralized proof of work-approach, which eventually makes the Bitcoin network secure («electricity-turned-trust»). However, the amount of electricity, while undoubtedly contributing to a positive subjective valuation of users, is not the value of the network itself. In fact, current electricity costs are nowhere near the «value», or price, of a Bitcoin token. For the same reason neither does Bitcoin’s value stem from its «trustless» database (the «blockchain») nor from the algorithmic scarcity (∼21 million), which is embedded in the Bitcoin protocol. These features of the Bitcoin network are «only» reasons why people use the network. Take gold as an example: Its useful properties (relatively scarce, malleable, durable etc.) have contributed to its use as money for thousands of years. However, people had to discover gold to be more beneficial than earlier kinds of media of exchange in the first place. «Discovering» value is a purely mental, or psychological, process. Once enough people had made this astonishing discovery, network effects unfolded and made gold even more attractive as a means of payment. Demand and supply rose… market prices went up, too. So, next time when someone asks you whether it is the artificial scarcity, the electricity injected into the network, the «network effects», or even the pseudonymity of transactions, you know that these useful network features only act as potential reasons why people may assign some value to Bitcoin. However, those reasons are not the value of Bitcoin. Never! Valuation is always the subjective result of our mind. Optimists think that the course of events will be positive, for them personally or for society in general. Realists, on the other hand, think that the course of events might turn out to be positive; they concede, however, that they can’t really know since reality consists of complex phenomena. Optimism and realism are sometimes used as contradictory concepts. That doesn’t necessarily follow though. Liberal thinkers can often be described as optimists with a strong sense of reality. On the one hand, they hope that a particular situation will turn out well; they even provide policy recommendations in order to facilitate the process. On the other hand, liberal thinkers are skeptical of what men, in particular politicians and bureaucrats, are capable of achieving. They have a realistic perception about the nature of humans and their capabilities. Liberal thinkers can often be described as optimists with a strong sense of reality. Personally, I’ve always perceived liberalism as a philosophy advocating a realistic optimism. For instance, we can look back to the big controversy about socialist planning in the 1920s (the “socialist calculation debate“). Ludwig von Mises, Friedrich A. von Hayek and later Murray N. Rothbard argued that a planned economy must inevitably fail at some point because its planners lack the knowledge necessary to determine economic in- and outputs. Mises and Hayek were proven right with their predictions when the Soviet system collapsed economically and politically in the early 1990s. They were pessimistic about the Soviet economy, but both Mises and Hayek felt optimistic about their own policy proposals regarding the market economy. Liberals (read libertarians) can (and should) be more optimistic given the continuing overall trend which constantly confirms that people have become healthier, live in freer societies, and are better educated than in the 19th century (let alone earlier periods of mankind). At the same time, we have been warned that we should remain skeptical towards supposed panaceas and prophecies coming from the ones that think they will change the world single-handedly; the ones that feel confident that they possess the recipes to solve all the ills of mankind; and those claiming that their proposed solutions are without alternative. In his Nobel Prize lecture, Hayek invoked us not to be imprudent or foolish when it comes to people that pretend to know everything (“The Pretence of Knowledge”). His statement emphasizes that we should exercise restraint in our own dealings, but also remain extremely cautious about what politics can actually accomplish for the good of society. The right to be let alone, as Justice Louis Brandeis famously put it in “Olmstead v. United States”, is commonly associated with the right to privacy in the Fourth Amendment. The constitutional “[…] right of the people to be secure in their persons, houses, papers, and effects, against unreasonable searches and seizures […]” critically separates the spheres of life and wards off many dangers from the government. However, in a society so culturally diverse as ours, the right to be let alone takes on much greater significance than just separating the spheres between the individual and the state. A recent poll shows that Americans are divided on the role of culture in their society. Coming from Europe, the U.S. is undoubtedly a much more culturally diverse nation than most European countries, if not all. Unlike Switzerland, for example, Americans cannot rely on ethnic kinship for a shared identity. The U.S. is truly a nation of immigrants. The more surprising are the results of that poll showing that conservative and social-democratic opinions diverge in terms of fundamental cultural values. If we accept the fact that culture matters, we also have to concede that foreign culture should have a place in our society. Culture is a delicate issue. F.A. Hayek argued that culture matters and that it shouldn’t be denied in the political processes of a constitutional democracy, unless one wants to question the stability of a society. However, culture isn’t a rigid phenomenon either. The basic values of a society can change, and quite obviously, have done so significantly. Slavery, for example, once a shared value among many Americans and Europeans, was abolished in a justified fight against unjust values. If we accept the fact that culture matters, we also have to concede that foreign culture should have a place in our society. This doesn’t mean, though, that people native to a country have to give up on their own values. Quite naturally, the burden of responsibility must rest on those who immigrate to a foreign culture. However, we shouldn’t expect that everyone is willing to assimilate entirely. And this is where the crux begins. To put it in a nutshell, culture is omnipresent, it possesses a formative role in life like no other informal social institution. Cultural values are deeply embedded in social relations, parenting, education, and so forth, which is why we should never expect perfect assimilation from top-down integration programs, as sophisticated as they may be. However, the market, unlike any other institution, has the power to create peaceful cooperation among people of different cultures. It creates opportunities for those who are willing to integrate and to accept the traditions of the local population. Even more importantly, the market discourages people from thinking in entitlements. The culture of dependency, created by the welfare state, has not only made millions of individuals depending but has also evoked antipathy for foreigners and their diverse values with which they arrive at our borders. As Donald Trump’s presidential campaign platform impressively showed, once the state has created the feeling of being left behind, politics quickly becomes an outlet for racial slurs and cultural defamation. A government siding with one group of its population is highly problematic. In doing so, it does not only sow a lot of mistrust and resentment among those people with conflicting opinions but also conveys the belief that government is able to solve the problem, if necessary using force. What remains for us to do then? What then are the ideal conditions for the peaceful coexistence of people of a different cultural background? The German classical liberal economist and philosopher, Roland Baader, once said that there exists only one human right, the right to be let alone (“Das einzig wahre Menschenrecht ist das Recht, in Ruhe gelassen zu werden […]”). This is in fact how every human tribe started off before becoming part of a more involved society. Well, some groups, like the Amish people in the U.S. and Canada, believe in the fulfilled existence of remaining unaffected by unfamiliar values till this day. Oftentimes, however, foregoing the opportunities of cooperation will cost those people dear. In his book “Living Economics”, Peter Boettke shows that there exist myriad institutions that allow people to engage actively with each other, while living peacefully side by side. It is these “organic” institutions of self-governance that have proven themselves valuable throughout the world and that have supported people in coming together and starting exchanging not only goods but eventually ideas and their cultural heritage. However, to concede that culture matters, that of immigrants as much as ours, is the first step to recognize that peaceful community relies on everyone’s right to be let alone if he or she wishes to do so. In a very biological sense, the right to be let alone gives us the time needed to prepare ourselves for the world outside of our “cultural backyard”. It is true that we will always have to accept that some people are not willing to become part of a more heterogenous society. As I said, this is their very right. And sometimes, we’ll even have to defend the principles of an open society against violent aggressors. However, to concede that culture matters, that of immigrants as much as ours, is the first step to recognize that peaceful community relies on everyone’s right to be let alone if he or she wishes to do so. Majority voting inevitably alienates large parts of a population. As a Swiss citizen, I am all too aware of that fact, since we go to the polls as often as six times a year. This may be the necessary price of our more direct form of representative democracy. But in Switzerland, it has also led to a degree of emotional turmoil due to conflicting visions for society. Of course, the US has a similar problem. The election of Donald Trump has not only raised discussions about the workings of the electoral college but also about a possible exit of California from the union. Since a considerable 61.5%-majority of Californians voted for Hillary Clinton, some of them have deemed a separation to be a necessary response to a Trump presidency. Such a devolution of power is actually quite worthy of support. For centuries, legal scholars have acknowledged the importance of the right of secession based on natural law. The German Calvinist Johannes Althusius argued in his Politica (1603) that citizens have a right to forswear allegiance to the king in the case of an abuse of power. He considered this right to be derived from the general right of resistance. To Althusius, secession was a vertical check on the power of the early European absolutist states, but also a recourse that should not be undertaken on a whim. To Althusius and others, secession remained ultima ratio, i.e., a last resort. First and foremost, the state should be organized from the bottom in accordance with the broader “principle of subsidiarity,” of which secession is a part. Subsidiarity is a principle of social, political and economic organization. It comes from the Latin subsidium and means “support” or “reserve.” Subsidiarity holds that society is primarily based on self-determination and the individual responsibility of each person, his or her family, and private associations of individuals (cooperatives). Subsidiarity is a principle of social, political and economic organization. According to this principle, local government should be involved in solving problems only if private organizations are unable to resolve them on their own. If government at the local level is unable to do so, the regional government takes over or assists the local government. And finally, the central government or the king steps in if the federated states struggle to resolve it amongst themselves. Any higher level of societal organization is subordinate to any lower level. The main advantage of a multi-level order is that individuals make decisions that most affect their lives. Delegated decisions are made as closely to the citizens as possible so they can oversee the process more easily. Paths taken that turn out to be successful can thus be adopted by any other territorial entity or authority. Only this type of “political fragmentation” can preserve cultural diversity in the long run and lead to institutions, such as the competition of ideas, which ultimately serve individual freedom. Althusius’s main insight was that the higher institutions should be required to rely on the consent of the more local levels and voluntary associations. Because the powers of the higher levels are derived from the consent of the people, the people must retain the ability to revoke that power whenever necessary. Althusius’s views on political subsidiarity were quite radical for his time. Located in Emden, a German town at the crossroads of political and religious activity at that time, Althusius’s ideas should be interpreted in the light of the Calvinist Dutch Revolt against the Catholic King Philip II of Spain, which effectively ended in 1609 and resulted in the “Dutch Miracle,” a century-long period of economic, scientific, and cultural growth that helped lay the foundation for the rise of classical liberalism. Two centuries later, these ideas found fertile ground on the North American continent with the revolt of the thirteen colonies against the British Crown. In 1848, Switzerland established a new constitution that also embodied the principle of subsidiarity, which remains in force to this day. Unfortunately, the same people who are now in strong support of “CalExit” would probably think differently, if, say, Hillary was elected back in November. It also seems unlikely that they would be receptive to a declaration of secession by Northern California (which leans more Republican), or the city of Los Angeles. The irony in their opposition to such actions would likely escape them. Human affairs should be entirely private. If government is going to be involved, autonomy at the local and state level should be as high as possible, meaning that all functions, excepting at most military defense, the supreme court and trade policy, should be pursued by local or state representatives. Moreover, the tax system should be fully and exclusively devolved to the local and state level. Therefore, each state would be solely responsible for its revenues and expenditures. Only then would citizens have a reliable picture of the government’s service quality, and only then would they systemically be able to monitor the politicians in a sensible way. Moreover, the tax system should be fully and exclusively devolved to the local and state level. Whenever someone disagrees with a policy or the advocated values a political system implies, they can vote with their feet by leaving their present domicile. Regulatory and tax competition would ensure an attractive environment for each and everyone. To provide a last resort, and to circumvent any undue burden set on people willing to move away, the constitution should formally grant the right to secede from the union and/or the respective state. The great wave of nation-building in Europe during the 18th and 19th centuries is being reversed. Separatist movements are so common that we would easily run out of space if we attempted to describe all of them. Consider the case of Spain. The “Reino de España” has seventeen autonomous regions. Each has ambitions to leave the Kingdom. Many believe that secession is only practical for economically powerful regions. For example, California’s economic output has even surpassed that of France. Smaller territories can, however, successfully break away if the right policies are put in place. Indeed, a breakaway region’s lack of economic self-sufficiency is actually a benefit, because it would make a policy of free trade absolutely vital. Such would be the case if, for example, Murcia, an autonomous region in southeast Spain, succeeded in separating from the Kingdom. The Murcians have many differences with the population in the rest of the country (not only from the Madrilenians in the capital city). For example, they have developed a dialect, much of which is derived from the Aragonese, the Catalan, and the Arabic language. 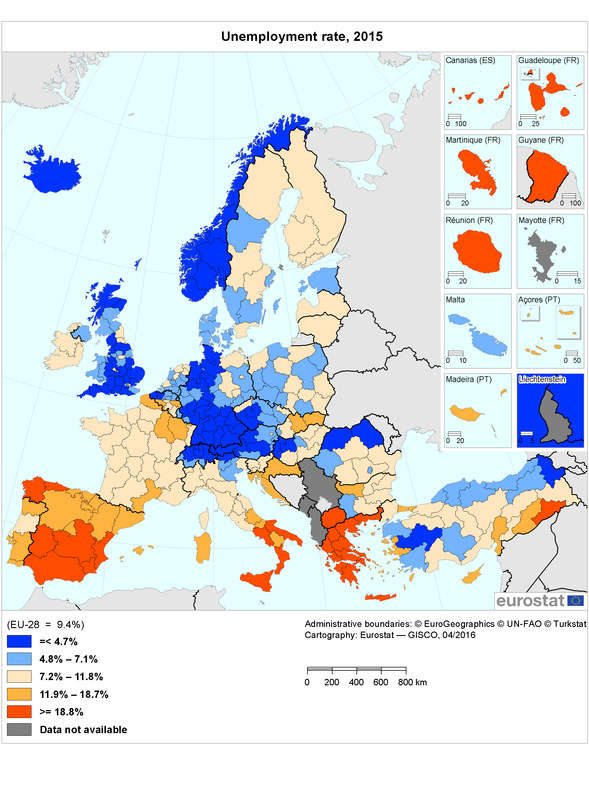 Murcia is a comparatively poor region with an unemployment rate of over 25%. Without the benefit of a large economic hub like Barcelona in the Catalan area, the Murcian economy has lagged behind that of the Catalans. According to the principle of subsidiarity, the Murcians should be allowed to set their own fiscal policy and respond to the Euro crisis in their own way. However, governments in Brussels and Madrid are the ones attempting to manage the economic recovery of Murcia. There is no guarantee that the arsenal of unorthodox monetary policies being employed by the European Central Bank will end well for the Murcians, even if it were to help other areas. This is also true for the separatist Sardinians, the independence-seeking Scots, the Flemish Belgians, and the people in Veneto Italy, to name but a few. Many people recoil at the idea of some regions permanently living at the expense of other regions. Economically strong regions have a strong incentive to break their commitments to less wealthy regions by seeking autonomy, and eventually formal secession. In the German fiscal equalization system, for example, only four states out of sixteen and less than half of the German population foot the bill for the entire population. The originally unintended consequence of this perverse system of income redistribution is that the politicians in the taker states have no incentive to improve their policies, while the states that pay into the system, such as Bavaria, have little hope of voting against those policies or monitoring the spending process. Politicians can run unprofitable projects at the expense of the contributing states, such as the embarrassing Berlin Brandenburg airport, for which the cost has tripled to 6 billion euros. Unsurprisingly, the Bavarian separatist movement has gained traction in recent years, although it has also suffered setbacks in Germany’s Federal Constitutional Court. However nice the wording, the EU Commission can easily come up with any justification for the use of a non-exclusive competence. And even if they wanted to question the Commission, individuals, municipalities, and regions in member states would have difficulty satisfying the requirements for nullifying an EU law. Moreover, the European Court of Justice, financed and justified by the acts of the European Union, is well-known as the “motor of integration”. There is little to expect from the efficacy of the EU’s principle of subsidiarity, and looking at the numbers, there hasn’t been a single action brought forward by a member state or a private person so far. Switzerland is hardly better in this respect. According to the Swiss Federal Supreme Court, the constitutional principle of subsidiarity (article 5a, 43a) is not enforceable. It’s only a political guiding principle in favor of strong federalism. However, Switzerland is far smaller in terms of size (less than 16,000 square miles) and population (8.4 million) than most European countries, let alone the supranational EU. Yet, the Swiss Confederation possesses three layers: the federal level, the 26 cantons, and the 2,300 municipalities. This system has developed historically, and given the cultural and linguistic diversity (German, French, Italian, and Romansh), it has served the country well in the past. However, even Swiss federalism has been in decline. In 2016, the number of municipalities was down to 2,300 from 3,200 in 1848, when the Swiss federal state was founded. It’s mostly for economic reasons, such as cost savings, that municipalities have been merging faster than ever. However, these alleged cost savings are, to use Bastiat’s words, only the seen effects. The unseen effects include the loss of closeness to citizens and the increase in their rational apathy towards political commitment that could increase costs over the long run. If cultural cohesion changes, we should not only allow communities to secede but also allow individuals to vote with his or her feet. Unlike many outside observers, I doubt that we should credit the relatively small size of government in Switzerland to the more direct form of democracy alone. (If anything, it has also contributed to the expansion of the federal government lately.) Swiss limited government is, as Dan Mitchell also points out, mainly owed to the consistent implementation of the principle of subsidiarity, which has led to a relatively high degree of decentralization and sensible policies, such as the “debt brake” and cantonal tax competition. The effective enforcement of the principle of subsidiarity is an important safeguard for freedom. Government should be backed by real consensus about the shared values of the community in which it operates. Britain and maybe California appear to be such cases in which the consensus has begun to crumble. If cultural cohesion changes, we should not only allow communities to secede but also allow individuals to vote with his or her feet. In today’s rapidly changing world, it is more important than ever that people should be as free as possible to choose the rules and rulers governing them. While European governments and central banks have stepped up capital controls in the last few years, cash has become the major hurdle for conventional monetary policy. Therefore, many economists, as well as a number of high-ranking government officials, have presented and reiterated their arguments in favor of the abolition of cash virtually at every opportunity. Although most European citizens do not approve further restrictions on cash, the outcome of the political debate is open. The political reasoning for a ‘European’ war on cash is based on an ideological mindset that is identical to what is heard across the Atlantic. What is different, however, is the popularity of the use of cash, which also differs from country to country within Europe. Unlike the Scandinavians, who have largely moved to a cashless society, other countries still prefer to keep their notes and coins. Recent surveys show that over 70% of the German population opposes further restrictions on cash. Switzerland’s National Bank has announced that it will not follow other countries’ example of phasing out what is the world’s highest denominated bill (in terms of exchange rate value), the 1,000 Swiss franc note. People’s attitude towards cash appears to be influenced by the cultural context of a nation. Germans, for example, have faced at least four monetary reforms in the last 100 years. The great hyperinflation in the 1920s must have left marks in the Germans’ consciousness. Unlike the German currencies, the Swiss franc has never experienced monetary instability of comparable scale. It is rather the general suspicion toward government power that has led the Swiss to take a conservative stance towards cash. Today, and especially after 9/11, restrictions on cash have increased exponentially. Denmark and Sweden are at the complete opposite. These countries have officially passed legislation in order to discontinue cash step-by-step. The largest Scandinavian banks have recently stopped allowing cash withdrawals in most branches. Moreover, the financial industry has actively encouraged regulation limiting cash use in daily transactions in the name of fighting crooks and protecting the environment. Finally, Danish law leaves the decision whether to accept cash or not to the providers of goods and services; as of this year, clothing stores, restaurants, and gas stations are allowed to turn away customers who cannot pay electronically. It is literally a Scandinavian war against cash that has taken place in the last decade. Internationally, initiatives against cash reflect the current interconnectedness of financial markets. The emergence of a globalized financial system led to the regulation of cross-border payment transactions and capital flows. The original intent was to make it harder for criminals to channel in money that originated from crime. Regulation of cash deposits and withdrawals at banks was initiated as early as in the 1970s in the USA and in the 1980s and 1990s in Europe. Most legislation is supposed to prevent money laundering and terrorist financing. However plausible these reasons are, they have also been blatantly misused in the war on cash. Since the European Union is competent in the field of anti-money laundering regulation, there has been great effort to harmonize national laws. The EU finance ministers have recently called the EU commission “to explore the need for appropriate restrictions on cash payments exceeding certain thresholds” throughout the Union, and, to the same effect, the European Central bank has announced its willingness to “examine the consequences of phasing out” the 500 euro banknote. Despite this political agenda and its questionable implementation, many countries of the Eurozone have already put in place strict measures: The French government tightened restrictions on cash payments and intensified monitoring of high-value withdrawals after the latest Paris terrorist attacks; the upper payment limit was lowered to 1,000 euros. Italy recently went back to its former limit of 3,000 euros. Payments exceeding these amounts must be executed through a licensed bank. While extending the scope of the anti-money laundering statute to non-financial intermediaries, even Switzerland now regulates transactions over 100,000 Swiss francs. Yet, it is unlikely that the political intention is to stop discriminating cash users at some point but rather to incrementally reduce the allowed transaction limits, and eventually, to discontinue the use of cash entirely. Following the meltdown of the financial system in 2008, governments collaborated with the financial industry by bailing out large banks in an unprecedented way. As a consequence, public debt levels have surged. At the same time, interest rates are at the lowest possible, approaching zero. We have reached a point in the fiat money system where even unorthodox monetary measures, such as ‘quantitative easing’ or ‘helicopter drops’, have missed their official goal of stimulating the economy. Newly printed money has barely been going into real capital production, but it has rather been inflating asset prices; instead of investing in new products and services, many businesses have recapitalized on better terms, performed buybacks or paid out dividends to their shareholders. This is a good thing for banks because they are relieved from servicing “toxic assets;” however, such a monetary policy is not able to boost the economy in a sustainable manner. This is where cash comes in: Cash has become a real drawback according to mainstream economic theory. It limits the central bank’s ability to reduce short-term (nominal) interest rates below zero. According to the concept of “zero lower bound”, if interest rates drop into negative, bank account holders are encouraged to withdraw their savings and keep them as cash. Given that cash does not pay any interest, it is still better to hoard cash under the mattress than to leave it in the bank where it is charged negative interest or a fee. If falling rates exceed the costs of holding cash at home or in a safe deposit box, people will withdraw en masse. It is obvious that banning cash would not build up confidence in the current system, but rather destroy the last bit of it, as recent data on growing cash circulation in the Eurozone, Switzerland and the UK indicate. The problem about this is that the viability of certain fiat currencies genuinely depends on substantial cash restrictions. If cash were abolished, any fiscal or monetary policy would be enforceable in the short run. A little bit of tapering might be bearable for the US dollar, if interest rates return to pre-crisis levels. However, it will not be the case for the Eurozone and would provoke the exit of a member country. It is therefore essential to certain European countries (and to the EU itself) to increase the degree of financial repression in order to refinance their debts and deficits at the expense of the public. If cash were abolished, any fiscal or monetary policy would be enforceable in the short run: Increasing negative interest would force bank account holders to spend their money or to invest it in riskier assets, such as bonds or stocks. Despite the disastrous effects on the economy, such as malinvestment, outright confiscation of wealth would hit account holders even harder: In a system where all money is electronic, bail-ins, capital levies, or seizures could be imposed on bank customers without them having the slightest chance to avoid those controls. It is obvious, though, that such a policy would pervert the original purpose of money, which is above all to securely store value. Proponents of anti-cash policies too often forget the non-coercive character of money. Describing its emergence, the great Austrian economist Carl Menger points to the fact that “[c]ertain commodities came to be money quite naturally, as the result of economic relationships that were independent of the power of the state” (Principles of Economics, 1871, Auburn , 262). In other words, banning physical cash would simply lead to the emergence of alternative means of payment that would outcompete official tender. A lot of people would start using near-money substitutes, such as gold or silver, or whatever commodity facilitates the exchange of goods and services instead. Ignoring this fact shows us how little mainstream economists know about the origin of money and how much they overestimate the validity of their policy advice. Actually, there are good reasons to oppose fiat currencies. They are inherently flawed due to a lack of competition. However, when it comes to the physical manifestation of fiat money, i.e. cash, there is a need to differentiate. In the existing context, cash truly means freedom, at least in the sense of less state control or more options to choose from. Let us have a look at recent examples in Europe: Greeks have experienced far-reaching restrictions on cash withdrawals at the peak of the debt crisis, bank customers’ deposits in Cyprus were bailed in up to 50 percent in March 2013, and Italian and Portuguese bondholders have been forced to acquire stocks of insolvent banks for the last two years. These are all too familiar stories in Europe today; financial repression seems to be the political panacea to overcome the consequences of preceding government failure. The abolition of cash would represent the logical next step in a series of detrimental government interventions. Yet, it would never justify such an extensive infringement of personal liberties. When it comes to creeping state control, it is no surprise that certain European countries, such as France, are at the forefront. An electronic world would be far easier to both tax and control. Such a narrow view on the issue of tax evasion, however, completely ignores the root causes for tax evasion in the first place. Furthermore, the abolition of cash might reduce the black market economy at first, however it would just be a question of time until black markets would thrive even more. Cash does not only mean privacy towards state agencies, but also towards data gathering companies. In other words, the end of cash is also the end of privacy. A cashless society would give governments and businesses access to information and power over citizens in an unprecedented manner. Considering the ubiquity of money in our society, no sphere of life would be left untouched. Physical cash offers a fallback option for the time governments become prohibitive or electronic systems break down; cash literally offers insurance to its owner and thereby protects him or her from the loss of freedom and property. Cash is said to be inefficient and primitive; however, anti-money laundering regulation has artificially increased costs for merchants who prefer cash. In a market economy it is not up to the banks (or the government) to decide on the means of payment, but to the consumer. And let us not forget: Cash is especially valuable to the billions of people who are unbanked or underbanked worldwide. Cash is no end in itself, but rather the indispensable means to exercise basic rights. Finally, cash embodies the value of unconditionality. Cash is basically not dependent on a third-person or a private contract. It is not contingent on the solvency of banks or the effectiveness of the financial system. Unlike bank money, cash transactions are immediately cleared and settled. The same is true for bitcoin, which is why the cryptocurrency is called electronic cash. There is one but significant reservation to the principle of unconditionality: Cash remains dependent on the solvency of its issuer, the government. The idea of an outright ban may seem far-fetched to some of us; however, the longer the interest rates stay low or negative, and the longer the economy does not get off the ground, the sooner unthinkable proposals could be argued as being without any alternative. Cash is no end in itself, but rather the indispensable means to exercise basic rights. Even if it were possible that hardly anything changed in a cashless society, the abolition of cash would de facto prejudice human behavior. Cash is not about illicit activities, but enabling a lifestyle that does not harm others. Fyodor Dostoyevsky wrote in 19th century-Russia that “money is coined freedom;” today, we would probably correct him: Cash is coined freedom.